On a recent trip to Brittany I rode with a local touring club and learnt about The Diagonales de France– like a multi-stage equivalent of Lands End to John-O-Groats. The challenge involves 9 randonnées based around 6 cities at the apex of the ‘hexagone’ of France: Brest in the West of Brittany, Dunkerque in Normandy, Strasbourg in the East bordering Germany, Menton on the Mediterranean border with Italy, Perpignan in the South and Hendaye, bordering the Spanish Basque country. Between these 6 cities are 9 routes. 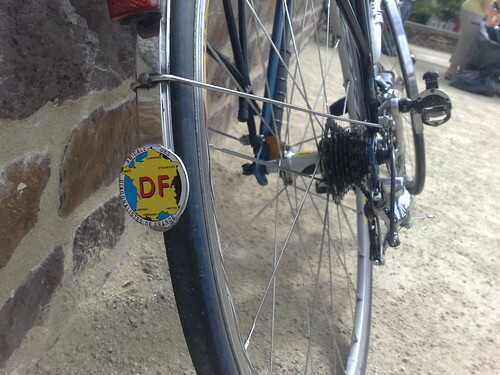 You must complete them all, to be able can call yourself a diagonaliste and apply the badge below to your bike. Routes between the adjacent cities are not part of the diagonales. Les diagonales must be ridden under certain rules- they are to be undertaken within the spirit of Velocio, in other words, non-competitively. It’s not a case of completing the route in the fastest time, rather, planning your schedule, whatever your pace or ability. You can take any route you want but must announce an itinerary in advance and stick to your schedule as close as you can. You stamp your card in a police station at the start and finish and other ‘diagonalistes’ or cyclotouristes are permitted to seek you out and ride with you on your trip or check that you aren’t cutting corners. Th gorgeous touring bike pictured was owned by a cyclist I rode with in a bunch one day in Brittany. I am not massively into touring but this was a thing of beauty, both in form and function. It was built on an old Gitane frame, with Ultegra components and had four chainrings. The rider was strong but you could tell it was built to eat up lots of miles. Loaded with panniers it may have weighed 25kg, and the small ring on the front was there to spin up and over hills along the Diagonales de France challenge. It had taken him 10 years to complete, riding a ‘stage’ every summer or so. It was equipped with dynamo lights front and back, with a modified downtube shifter mounted to the seat tube to switch the rear dynamo on and off. There was also an additional battery-operated front light, with a bar-mounted switch. The front porteur rack was nice in polished chrome (or maybe just stainless steel) to match the forks and other components. The bike had completed les Diagonales de France, and the next challenge on the horizon was the first Diagonale d’Europe – Brest to Inverness. 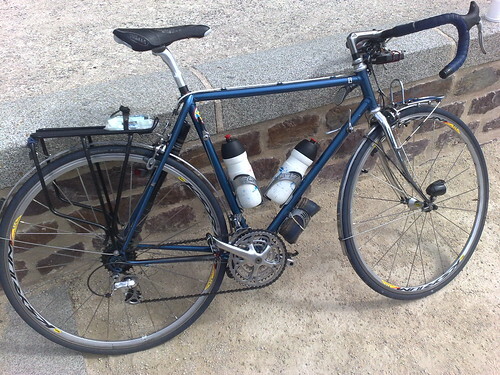 This entry was posted in Routes / Rides and tagged France, touring on July 21, 2011 by Owen.